In the past, the term ‘ready-to-assemble’ (or RTA) has been associated with cheap furniture of lesser quality than traditional kitchen cabinets. However, in more recent years, as RTA cabinets have evolved, they are regarded by contractors and designers as a sturdy and long-lasting wood product that can offer great value, quick turn-around time and easy assembly. There are many important features to consider when deciding whether to use RTA cabinetry for your project. Given the current state of the economy, more and more homeowners are choosing to renovate their homes rather than upgrading to a newer house. 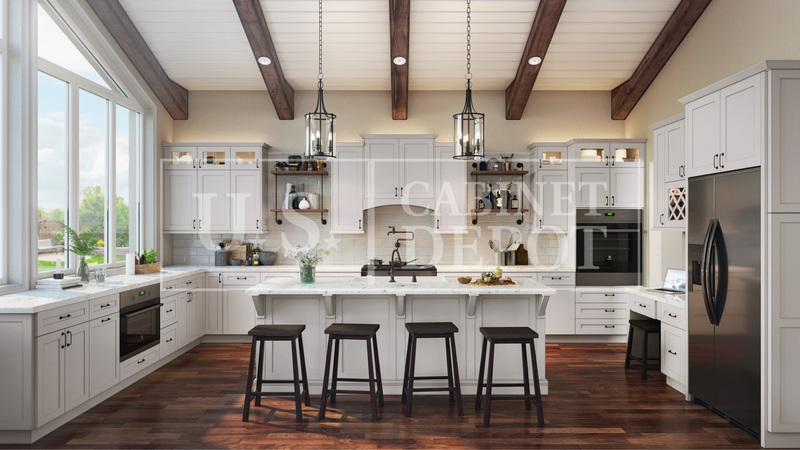 These improvements help to raise the value of the home and create a more comfortable space that they can enjoy as they ‘age in place.’ Aside from the countertops, cabinets are the most expensive part of a kitchen remodel. Choosing RTA will reduce the cost in a number of ways and still satisfy the desire for beautiful, well-built cabinets. The cabinetry itself is cheaper because it arrives unassembled. The homeowner can cut labor costs by opting to assemble the cabinets themselves. The cabinets are in-stock and ready to ship quickly. They are packaged in slim boxes and transported easily, which in turn will also help to save on freight charges. There is no need to compromise on quality when you can receive RTA cabinets with outstanding quality at a fraction of the price you would be charged from fine retailers or custom cabinet lines. Our RTA cabinets feature all-plywood boxes and soft-closing doors and drawers, among many other coveted characteristics. We also offer additional moldings, trims, pull-outs and accessories which help to create a custom look to rival what you may see in a semi-custom kitchen or bathroom. Ready-to-assemble cabinets are not assembled and, therefore, take up very little storage space. This allows for efficient warehouse stowing. RTA cabinets are always in-stock and available for fast shipping, including replacements, which makes them highly sought-after for the contractor or homeowner who needs a quick turn-around. For this reason, it is hardly surprising that the RTA cabinet business is booming. Custom-built cabinetry can keep you waiting for months, even for small replacement parts. Traditional cabinets are fully assembled and shipped in large, heavy boxes, causing a higher risk for damages when they are transported. RTA cabinets are often referred to as ‘flat-pack’ because, as the term suggests, they are packaged and shipped in a flat box, allowing for easier handling and lower freight costs. Another clear advantage of shipping flat-pack is the reduced chance of the order arriving in damaged condition. When the packages are loaded onto a truck or container, they are stacked in a way that maximizes space. The slim, light-weight boxes can be quickly and easily unloaded upon delivery. Many homeowners choose to leave the assembly and installation in the hands of a cabinet professional or remodeling company; however, for those on a tighter budget, it is important to keep in mind that RTA cabinets are designed with ease of assembly in mind. With some practice, even DIYer’s and novice handymen who have light experience with cabinets can assemble them quickly and with little effort. All of the parts and pieces required for assembly are included in the box, and the cabinets can be assembled several different ways, depending on preference.